... "Secretary Vilsack loves cookies and not me!" When I saw this in an email from agrarian writer Stephanie Ogburn, I thought it was Photoshop humor, but really it is from a USDA press release today. The press release describes a new anti-obesity public service announcement featuring USDA Secretary Vilsack and Sesame Street characters. Sesame Street came under fire from Commercial Alert in 2003 for its sponsorship from McDonald's, including a mini-advertisement adjacent to the public television show. Here is the current Sesame Street page thanking its sponsors, including McDonald's. Question for the comments: do you think the cold shoulder for broccoli in the USDA photograph is an oversight or intentional non-verbal communication? Update: a Facebook comment says, "hmm-- Kathleen showed this PSA at Mayoral Child Nutrition Summit today...the broccoli is portrayed very well in the spot...I think this is an oversight." Organic food probably has modest nutrient advantages over conventional food. For example, a literature review in 2008 summarized several hundred matched pairs, where one observation was organic and the other conventional. Organic had more nutrients in 61% of cases, which is notable but not overwhelming. It is wisest to make your decisions about organic and conventional food primarily based on your assessment of the environmental considerations. The nutrient differences are not as decisive. If you don't care about artificial pesticides or GMOs, you may prefer whichever is less expensive. If you want food grown without artificial pesticides or GMOs, you may prefer organic. In any case, I would not yet give credence to the much-circulated Reuters report yesterday that organic has no nutrient advantages over conventional food. The report is based on a literature review released yesterday through the American Journal of Clinical Nutrition. The review, funded by the UK Food Standards Agency, had different selection criteria from the earlier research mentioned above. It seems to me the new UK literature review was not sufficiently powered to detect the small advantages of organic that one might realistically expect. For example, unless there is an error (in tabulation or in my reading), it shows a 10% advantage of organic over conventional in zinc, but the result was not statistically significant (for example, because the sample size was not large enough). The authors say this shows organic is no better than conventional. But, nobody ever expected a greater than 10% advantage for organic anyway. Really, the new results are essentially consistent with the older research. I think the authors err in summarizing their results as refuting the earlier claim that organic food offers slightly more nutrients, and the Reuters report is mistaken in its news summary of this research. Despite the fact that these three categories of nutrients favored organic foods, and none favored conventionally grown foods, the London-based team concluded that there are no nutritional differences between organically and conventionally grown crops. I leave this fuss in the same place I started. There are probably modest nutrient advantages from organic production. Briefly liveblogging today's webinar on soda taxes and childhood obesity, from the Rudd Center on Food Policy and Obesity at Yale. David Ludwig's presentation, reviewing the scientific literature, is convincing that consumption of soda and other sugar-sweetened beverages increases body weight and risk of obesity for children. For my own purposes, I take this conclusion as fact and spend most of my mental energy engaging the interesting policy questions. Kelly Brownell reviewed objections that have been raised to soda taxes. First, the "Nanny State" objection -- the idea that the government shouldn't be telling people what to eat. Brownell's response is that the government already does tell us what to eat, through Dietary Guidelines and subsidies. I think that response won't carry the day, with politicians or the public. Dietary guidance, which summarizes the complex scientific literature but respectfully leaves concrete decisions to families, is different from a soda tax. Similarly, agricultural subsidies will be seen as very different in motivation and impact from a tax designed to encourage healthy beverage consumption. Second, the argument that soda tax will be regressive, hurting poor families disproportionately. Brownell's response includes the observation that low-income people have higher rates of disease, so the benefits of a soda tax are progressive. Also, if poor people shift to water, Brownell says, they will actually save money. Again, I think soda tax proponents have a tin ear for how poorly such arguments will play with potential allies, including advocates for low-income people and otherwise sympathetic legislators. Overall, proponents of a soda tax need to reach beyond the public health framework -- where childhood obesity is an illness that needs a medically prescribed remedy -- and reach out to economists, politicians, and others who are better prepared to engage likely public reactions to a proposed excise tax as a public health tool. Above all, any tone of eagerness to tax is politically deadly. It would be much wiser to adopt the tone that "nobody likes taxes, but, just as in our own families, hard choices must sometimes be made, and this one may help our children stay healthy." Several webinar speakers generally sounded more eager to tax. Michael Jacobson provided a helpfully skeptical summary of the political situation. Several current bills at federal level do not include a soda tax. Grassley and Baucus oppose a soda tax. Some tax-writing committee staffs have given a little attention to soda taxes as a possible revenue source, but that is not much to go on. The most likely scenario for imposition is during a federal or state fiscal crunch, as a convenient revenue source, along with alcohol taxes. That setting wouldn't bode well for building public support for the corresponding public health agenda. Additional information sources include an anti-tax group, the Robert Wood Johnson Foundation effort on childhood obesity, a recent Michael Jacobson editorial, and a Center for Science in the Public Interest website. Watching the American phosphate dilemma these days is like watching two trains streaking toward each other on a single track, headed for a wreck. One locomotive is powered by growing food demand and rising food prices, which leads to a greater need for phosphate fertilizer. As USDA's Economic Research Service explained recently in the March issue of Amber Waves, the jump in food prices from 2006 to 2008 led to a corresponding spike in fertilizer prices. Phosphate prices jumped 93 percent in just 12 months, reflecting high demand and low supplies [Update July 30: In the comments, R points out that the prices fell part way back again after 2008 and suggests that international capacity may respond fully within a few years]. Phosphate inventories fell 27 percent in the most recent data available (2007): "Domestic and foreign fertilizer producers were not able to quickly adjust production as inventories dwindled." These trends generate a huge economic incentive for increased phosphate production. The other locomotive is fueled by the growing environmental constraints on phosphate mining. As we noted briefly a couple weeks ago, 75% of U.S. phosphate fertilizer comes from strip mines in Florida, and it is not clean work. Though one can find sources more critical of the mining industry, my favorite source for explaining the complex array of environmental problems is the comparatively industry-friendly Florida Institute of Phosphate Research. Here is where things stand according to FIPR's detailed phosphate primer. Sure, phosphate mining generates radioactive waste, due to radon and other naturally occurring substances, and, sure, the level of radioactivity in most Florida phosphate byproduct waste exceeds EPA limits for agricultural or road-building uses. However, the radioactivity is not very dangerous and probably is not the worst environmental concern from phosphate mining. The honor of worst environmental concern might go to the air pollution (dust or flouride contaminants), or maybe the water pollution (heavy metals or fish-damaging acidity). Under routine operation using best practices, water contamination can be prevented, FIPR explains. "There is, however, the possibility of an accidental spill like the one that occurred in December 1997 when acidic water from a Mulberry Corporation phosphogypsum stack spilled into the Alafia River." It gets worse: "Improving the quality and reducing the quantity of the process water became an even higher priority for the phosphate industry after the Florida Department of Environmental Protection (DEP) inherited three phosphogypsum stacks with full ponds when Mulberry Corporation (a chemical processing company) declared bankruptcy in January 2001. These ponds contained billions of gallons of acidic water. Two stacks are in Mulberry in Polk County, where there was a spill in 1977 and one was at Piney Point in Manatee County where a spill would endanger Bishops Harbor, a prized estuary." But, even the spills may not be the most serious environmental constraint. From FIPR's phosphate primer, the worst constraint may simply be the opportunity cost of blighted land that is occupied by the mountains of phosphogypsum waste (1 billion tons in 25 "stacks" in Florida, with 30 million new tons each year) or the thousands of acres of clay settling ponds (occupying 40% of the land area of the extraction operations even after the operation is completed). In FIPR's characteristically understated account of the clay settling ponds: "Research has proven that there are uses for the land, but the uses are limited by the properties of the clay that leave the settling areas unstable. There is a strong public desire to cut down on the number of settling areas created." Indeed, FIPR's phosphate primer perceives growing residential populations, not limited supplies, as the fundamental constraint on increased production in Florida. You can just hear the tone of regret: "There is a deposit around the Boyette area in Hillsborough County, for example, that will likely never be mined because the land over it has been developed." The public relations folks for Mosaic, the largest mining company and a former Cargill subsidiary, avoided mining images in the following video [Update July 30: slightly toned down my description of this video]. Yet, hidden behind all of the orange tree groves and green soccer fields in the video, I think you can probably imagine in your mind the gray wasteland and hear the mechanical roar of the dominant image the film-makers excluded. I haven't seen Florida phosphate mining in the news much lately. But, watching the trajectory of phosphate fertilizer on the one hand, and environmental constraints in Florida on the other, I'll hazard a prognostication. One way or another, the phosphate fertilizer industry will come to a collision in the next couple years with sufficient force to make the news. In Seattle: "The Search for Affordable Nutrient Rich Foods"
A new study (.pdf) from King County (Seattle), Washington, looks into some of the leading concerns in national discussions of local food retail access -- (1) whether supermarkets are found in poor neighborhoods, and (2) whether food prices are higher in poor neighborhoods. Nadia Mahmud, Pablo Monsivais, and Adam Drewnowski find supermarkets in neighborhoods of all income levels. For most chains, outlets were found in both poor and rich neighborhoods. Each chain offered approximately the same prices in a store sampled from a poor neighborhood and a matched store sampled from a rich neighborhood. Yet, the chains differed from each other, with some chains having much higher prices in both kinds of neighborhood. The paper names the chains and has nice maps and tables of actual prices. Jessica Ilyse Smith reports this week's: Living on Earth is on GE corn used for ethanol production and proposed regulation. It can be heard online at anytime this week at and beyond this week can be found in the show archives. The agricultural giant, Syngenta, has petitioned the U.S. Department of Agriculture to grant its new genetically modified corn a non-regulated status. This means that the company’s new seeds could be grown without management or geographic restrictions across the country. Some food experts, and farmers, fear that if this corn is grown without limits, it could end up in the food supply. 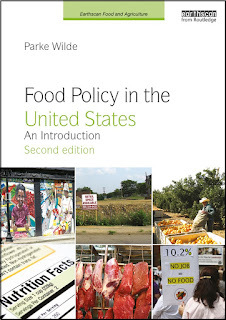 Jessica Ilyse Smith is a graduate of the Agriculture Food and Environment program at Friedman School of Nutrition Science and Policy at Tufts University. For people who want to know where their food comes from, Google Maps offers a profound passport to the landscape you choose to view, in place of the pastoral image that an interested party wants you to view. For most of these locations, you can explore even more using the street view feature. 10. The world's largest pork slaughterhouse, the Smithfield plant in Tar Heel, NC, where workers are voting this month on a collective contract after years of company resistance to union organizing. For what it's worth, the Rolling Stone magazine doesn't think so highly of Smithfield. 9. Center-pivot irrigated fields drawing from the Ogallala Aquifer, which is being depleted by municipal and agricultural use. 8. Joel Salatin's Polyface Farm in Virginia. 7. 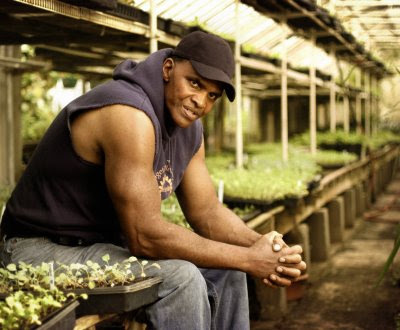 The largest urban community farm in the United States, 14 acres in South Central Los Angeles, topic of the documentary movie, now bulldozed this year. 6. Phosphate strip mines and accompanying retention lagoons in the Bone Valley in Florida, generator of mountains upon mountains of slightly radioactive phosphogypsum waste that nobody knows how to dispose safely, source of 75% of phosphate used in U.S. agriculture, and hence an essential engine of agricultural industrialization. 5. The Canada / U.S. border between Montana and Saskatchewan. What makes this view fascinating is that this border was drawn along a line of latitude, not according to the landscape, so there is no fundamental natural difference in the land on the two sides of the border. Use the left and right scroll key to range for hundreds of miles in either direction and absorb a deep lesson in how policy influences the way land is used. 4. Farmland conversion to suburban style housing developments in eastern Pennsylvania, near the farm where my grandfather grew up and where my wife and I were married outdoors, with cows mooing nearby. Am I understanding this image correctly? Perhaps Google Maps has updated its street database more quickly than its satellite images, so that this image superimposes the names of the environmentally foolhardy cul-de-sac style subdivision streets over the slightly older satellite image of (on the left) the construction sites and (on the right) the farms that once were there? 3. Pineapple countryside in Hawaii, just because it's pretty. 2. Concentrated Animal Feeding Operations (CAFOs) in North Carolina. 1. In the Iowa heartland, the little 1-mile distance indicator ruler from Google Maps is redundant. Please contribute your own additions to this list in the comments section. This blogpost is participating in a Registered Dietitian Bloggerfest. Please check back daily and use the links below to read other RD's posts on Woman's Health. This post is dedicated to women coming together is special ways make the world a better place. the Pleiades, or seven sisters, are an open star cluster in the constellation of Taurus. It is among the nearest star clusters to Earth and is the cluster most obvious to the naked eye in the night sky. Pleiades has several meanings in different cultures and traditions. The mission of our group, Pleiades, is to "create a network of leading women thinkers to be an inspirational force within the sustainability movement. Leveraging the talents of its diverse members, Pleiades provides strategic partnerships and educational initiatives that empower the role of women in restoring balance in our lives, our communities, and the natural world." The group was the brain child of Kathleen Frith, Assistant Director of Harvard's Center for Health and the Global Environment that stemmed from an idea she had in her early 20's. Our first meeting was held at member Ana Sortun's Sofra Bakery and Cafe in Cambridge. We enjoyed delectable yet simple, healthy food made of conscientious ingredients and tasted some organic and biodynamic wines. While this seems like the typical "Slowfoodie" event often criticized for being elitist, a fly on the wall would argue that the conversation had this evening was far from elitist. A round of introductions revealed accomplished writers, activists, scientists, mothers, health care providers, farmers, teachers, artists, environmentalists, all of course, women. I was humbled to be surrounded by such agents of change. After we enjoyed some nourishment, we moved on to a discussion. Dr. Molly Kile, a research fellow and epidemiologist in the Department of Environmental Health shared her experience in Bangladesh. In the 70's Bangladesh had a Cholera outbreak that was being perpetuated by the people's use of surface water. The international community came together to help fund water pumps that would give the people access to ground water and help control the epidemics. What is saddening is now Bangladesh faces arsenic exposure at daunting levels. It is disheartening to attempt to solve one problem, only to unavoidably create another. Molly went on to share her story of her recent visit to Uganda, a nation of 30 million people, which according to the World Health Organization had an estimated 10.6 million cases of malaria in 2006. The estimated 70,000 to 110,000 deaths a year seriously hampers economic development. Molly's descriptions of suffering was difficult to hear. Having worked in extreme poverty, she said that regardless, you can never prepare yourself. What is interesting about this story, and so conflicting to Molly, is that Uganda is being pushed to spray the infamous insecticide DDT to control the mosquito populations. Since the publishing of Rachel Carson's Silent Spring, DDT has been banned from the US for its serious wildlife and habitat destruction. While this isn't the only approach, unfortunately things come down to the price, and DDT is cheap and effective. Molly's memory of stepping over dying children conflicts with her knowledge of the repercussions of using DDT and is sympathetically felt.Those who understand sustainability know that trying to solve the malaria problem with DDT only leads us down a path of more complex issues. What seems a silver bullet is actually a shotshell, causing unapproachable damage. Our conversation turned to some very difficult questions. What is out of balance in the system? How can balance be restored? How does population and population control play a role? How do we address issues culturally? Why is money alway at the root? What can I do? As the intensity of the conversation began to lighten, Kathleen brought us full circle to answer the question, "What can I do?" Having just spent a couple hours hearing a story, asking questions and discussing what is often difficult to discuss, we had achieved a part of Kathleen's vision for the Pleiades: to learn from and support each other. Through one person's account we all knew a bit more about our world and our place in it. What is interesting about the Pleiades constellation is that it is easier to see clearly out of your peripheral vision. Our group hopes to be seen making change within the peripheral of our community and world. In a world facing insurmountable issues like poverty, climate change, disease, water and food shortages, habitat destruction and economic downturn, we can often feel helpless. For many women, the strength of community helps lessen the burden and gives an arena to discuss solutions, but this gathering of women is also good for our health. According to a new study when women are under stress they release more oxytocin, which encourages us to care for children and hang out with other women, creating a “tend and befriend” notion developed by Drs. Laura Klein and Shelly Taylor. Want to make a difference in your community? Start a community women's group. Talk about the issues facing your neighborhood and your world. Be a source of strength for each other. A woman's traditional role in the society is the nurturer and our communities could use a bit more nourishment. By creating a space to have the talk that women have when they are together, you are being the change. Charisse McElwaine - Spending too much time on the "throne?" If we look to history for clues as to what size jeans we will be wearing in 2011, our past recessions serve as imperfect precedents. The Great Depression may be the closest equivalent to the current economic crisis, but the nutritional landscape was very different then. "There were no televisions; levels of restaurant consumption were vastly lower; processed food consumption was much lower; and levels of physical activity were higher, especially among lower-income people," says Parke Wilde, Ph.D., a food economist and an associate professor at the Friedman School. A better comparison may be 1982, when joblessness reached a high of 10.8 percent. People didn’t slow their food spending (it increased by 5 percent), and in fact, new-fangled "health foods," including low-fat and low-sodium products, did quite well. But at the time, the percentage of obese adults was only 15 percent. It is now closer to 34 percent. "Something has happened in the last 30 years that the whole middle of the distribution has shifted in weight upwards," Wilde says. "And so you really need to look at things that are characteristic of the last 30 years." One thing we’ve discovered during that time is that hunger has a relationship to obesity. In 2006, Wilde and Friedman School doctoral student Jerusha Peterman, N11, published a study showing that women who have difficulty putting food on the table every day are 58 to 76 percent more likely than other women to be obese or gain weight over time. Other studies have drawn similar conclusions. One found that toddlers whose families have gone hungry are three to four times as likely to be obese. The reasons behind this nutritional paradox are unclear, but it is no secret that junk foods filled with calories, refined grains and sugars are a cheap and easy way to fill up. This has spurred Wilde to get to the bottom of a question that has plagued public health officials and shoppers alike: Does it simply cost too much to eat a healthy diet? Healthy food is about much more than obesity prevention. Yet, in its place, without obsession, obesity deserves a place on the list of nutrition concerns, not for cosmetic reasons, but because it is connected to diabetes, heart disease, and other chronic diseases. The leading theory is that increasingly abundant and inexpensive and palatable food, combined with lower physical activity, has produced rising rates of overweight and obesity. If you just look at the changes in the food system, restaurant industry, sweeteners, sedentary lifestyles, and food advertising to children, it is entirely plausible that calorie balance explains the changes in obesity. In addition, there are a hundred theories about the one thing that obesity is "all about" -- maybe it's the insulin, or the HFCS, or the carbs, or the meat, or the fat, or the chemicals, or the lack of fiber, or the glycemic index, or the volumetrics. Proponents of each of these theories will admonish us to read "the science," by which they mean "just part of the science, please." My advice is to follow each of those theories as their evidence base develops, but don't throw your weight or authority to any of them yet. The most astonishing passage in the Washington Post's fascinating and detailed article about organic standards today comes from Joe Smillie, a member of the National Organics Standards Board (NOSB) and an executive at Quality Assurance International (QAI), a leading organics certifier. Will Allen, a 2008 MacArthur Fellow for his leadership in Milwaukee's Growing Power project, is the focus of a nice piece in the New York Times this week. Elizabeth Royte's article discusses the good food movement's reach into low-income communities. If there weren't a place for people from all backgrounds, Grist food editor Tom Philpott says in one quote, "we’ve got big problems, because the critics will be proven right — that this is a consumption club for people who’ve traveled to Europe and tasted fine food."